This beautiful south facing two bedroom, two bath condo is the perfect spot for your next North Myrtle Beach vacation getaway. Enjoy the Ocean Drive Difference by starting your vacation immediately upon arrival, as this property comes with fresh bed linens/bath towels, the beds are already made up for you, and the departure maid service are all included in your price. When you choose Tilghman Beach & Golf Resort 9012, you'll enjoy all the amenities this gorgeous resort has to offer, including indoor and outdoor pools, lazy river, indoor and outdoor whirlpool spas, steam sauna, exercise facilities and the poolside grill. The master suite offers a king bed and opens to your own private balcony with views that stretch all the way down the coastline, a high def television and includes a master bath with garden tub. 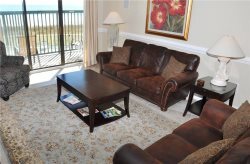 The spacious living area boasts a flat screen high def television with DVD player, comfortable furnishings and another private balcony with views of the ocean, the Surf Golf Club and Tilghman Lake. The fully equipped kitchen with granite countertops includes everything you'll need to prepare meals and the washer and dryer make keeping up with those beach towels convenient and easy! This gorgeous condo also has a breakfast bar and full dining area. You'll also be within an easy drive to area attractions, restaurants, shopping, entertainment and championship golf courses when you make Tilghman Beach & Golf Resort 9012 your vacation home.